05/17/17 Better Business Bureau Recognizes U.S.E.C. LLC, as the 2017 Winner of Distinction Award. 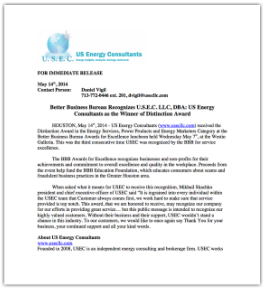 05/23/16 Better Business Bureau Recognizes U.S.E.C. LLC, as the 2016 Winner of Distinction Award. 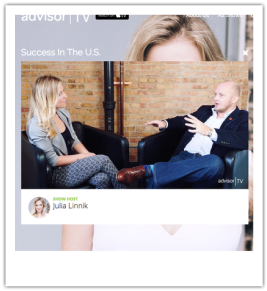 12/03/15 Advisor.TV featured Mikhail Skachko in their Success in the US show. 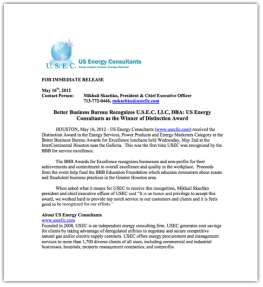 5/22/15 Digital Journal featured USEC Press Release recognizing US Energy Consultants as the 2015 Pinnacle Award Winner. 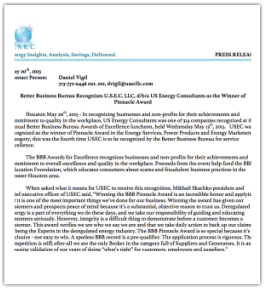 5/22/15 Release Wire featured US Energy Consultants in recognition for being awarded the 2015 Pinnacle Award by the Bette Business Bureau. 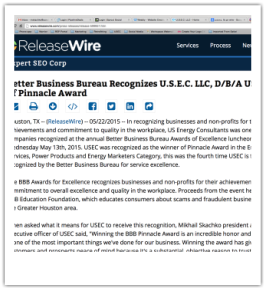 05/20/15 Better Business Bureau Recognizes U.S.E.C. 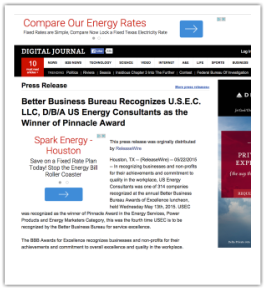 LLC, as the 2015 Winner of Pinnacle Award in the Energy Services, Power Products and Energy Marketers Category. 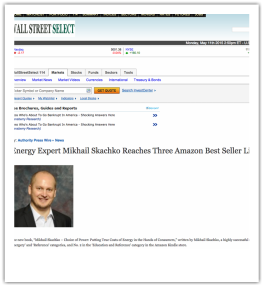 01/26/15 Bloomberg Business, Energy Expert Mikhail Skachko, recently reached three Amazon Best Seller Lists with his new book, Mikhail Skachko - Choice of Power: Putting True Costs of Energy in the Hands of Consumers. 01/23/15 The Wall Street Journal featured an article in reference to Choice of Power: Putting True Cost of Energy in the Hands of Consumers, written by Mikhail Skachko. 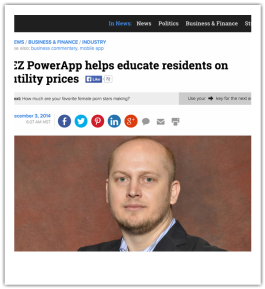 01/23/15 Authority Presswire featured a press release in reference to Mikhail Skachko's book, "Choice of Power: Putting True Cost of Energy in the Hands of Consumers". 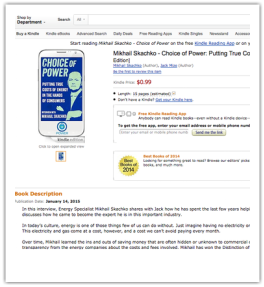 01/14/15 Mikhail Skachko published on Amazon, Download Mikhail's first published book, Choice of Power: Putting True Costs of Energy In The Hands of Consumers [Kindle Edition]. 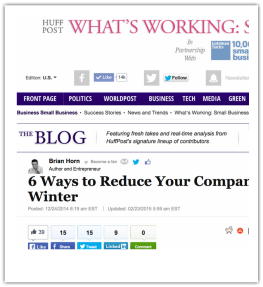 12/24/14 Huffington Post featured Energy Expert and CEO Mikhail Skachko, 6 Ways to Reduce Your Company's ﻿Electric Bill This Winter. 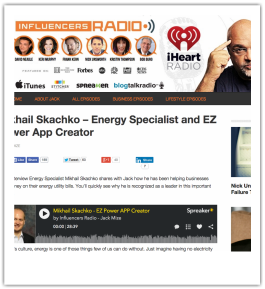 12/07/14 Influencers Radio interview with our CEO Mikhail Skachko, In this interview Energy Expert Mikhail Skachko shares with Jack how he has been helping businesses save money on their energy utility bills. 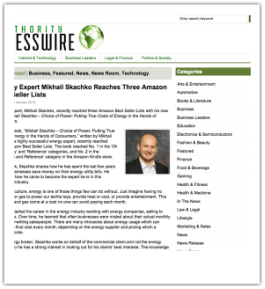 12/03/14 Examiner Article, Featuring our CEO Mikhail Skachko. 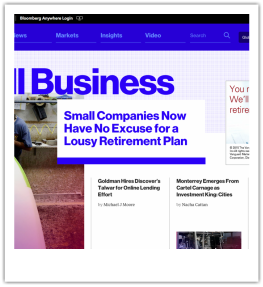 This article is geared towards the residential customer, Mikhail Skachko is an inventor of revolutionary smart phone application called EZ PowerApp. 05/14/14 Better Business Bureau Recognizes U.S.E.C. LLC, as the 2014 Winner of Distinction Award. 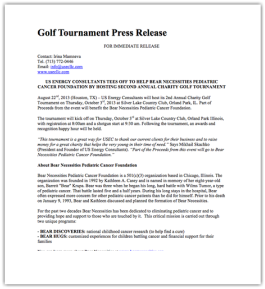 08/22/13 USEC hosts Second Annual Charity Golf Tournament, Part of Proceeds to benefit Bear Necessities Pediatric Cancer Foundation. 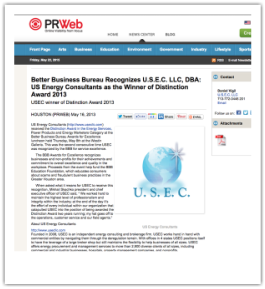 05/16/13 PRWeb featured USEC Press Release in recognition of the 2013 Distinction of Excellence Award. 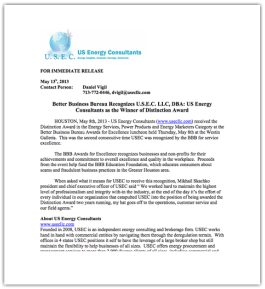 05/13/13 Better Business Bureau Recognizes U.S.E.C. LLC, as the 2013 Winner of Distinction Award. 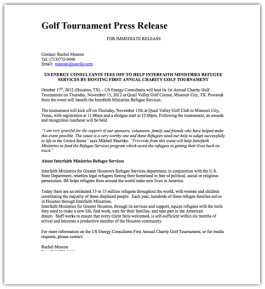 10/17/12 USEC hosts First Annual Charity Golf Tournament, All Proceeds to benefit Interfaith Ministries Refugee Services Program. 05/16/12 Better Business Bureau Recognizes U.S.E.C. LLC, as the 2012 Winner of Distinction Award.